44 THE SHOP JANUARY 2019 HORSELESS CARRIAGE FOUNDATION www.hcfi.org One item I wanted to find at Chickasha was a repair manual for a 1912 Sears car. 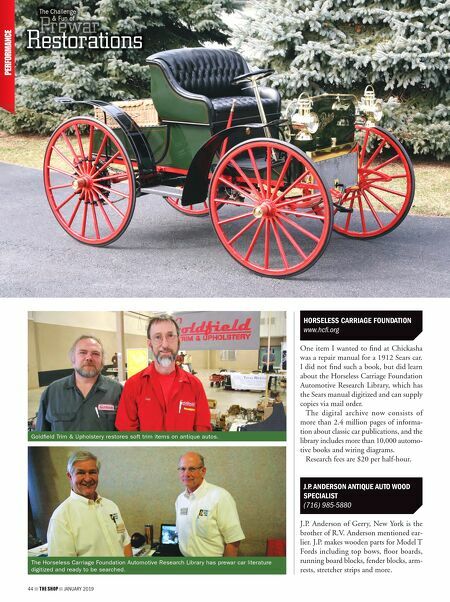 I did not find such a book, but did learn about the Horseless Carriage Foundation Automotive Research Library, which has the Sears manual digitized and can supply copies via mail order. The digital archive now consists of more than 2.4 million pages of informa- tion about classic car publications, and the library includes more than 10,000 automo- tive books and wiring diagrams. Research fees are $20 per half-hour. J.P. ANDERSON ANTIQUE AUTO WOOD SPECIALIST (716) 985-5880 J.P. Anderson of Gerry, New York is the brother of R.V. Anderson mentioned ear- lier. J.P. makes wooden parts for Model T Fords including top bows, floor boards, running board blocks, fender blocks, arm- rests, stretcher strips and more. 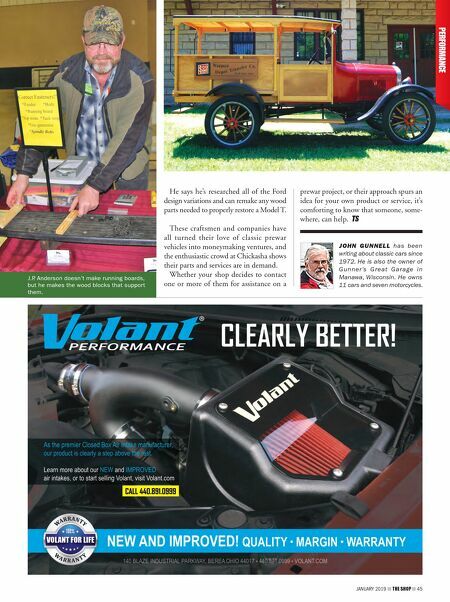 Prewar Restorations The Challenge & Fun of Goldfield Trim & Upholstery restores soft trim items on antique autos. The Horseless Carriage Foundation Automotive Research Library has prewar car literature digitized and ready to be searched.